StopTheJNF South Africa aims to end the role of the Jewish National Fund in the ethnic cleansing of the Palestinian people. The JNF portrays itself as a “green” organisation but at the same time it is involved in human rights abuses against the Palestinian people – including house demolitions and forced removals. Furthermore, the JNF administers 13% of Israeli land (which it does not allow Palestinians to use) and jointly (with the Israeli Land Authority, an Israeli government body) administers another 80%. Israeli land policies are discriminatory and the JNF is intimately involved (and complicit) in maintaining and administering these policies. Attached are two brief pamphlets on the JNF. 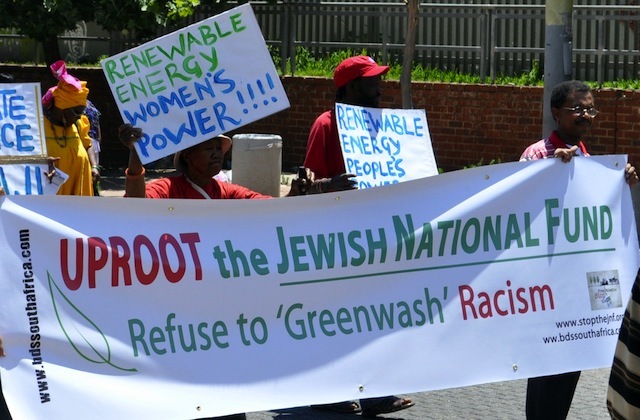 The direction coming from the Palestinian branch of the global environmental network, Friends of the Earth International, is clear: “The JNF is an organisation with explicitly racist aims of conquest. We call upon all those committed to environmental justice to cease and refrain from working with the Jewish National Fund”.